Moringa oil possesses exceptional oxidative stability which may explain why the Egyptians placed vases of Moringa oil in their tombs. Moringa oil has a potent antioxidant considered to be the factor behind its remarkable stability. 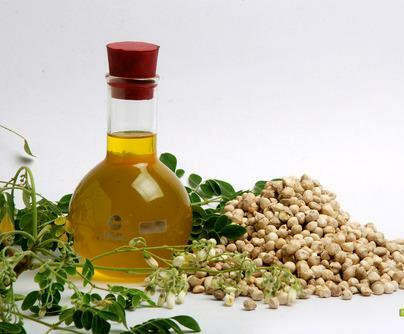 Moringa oil is non-drying nutty flavored oil with a pale yellow consistency. The healing properties of Moringa oil, also known as behen oil, were documented by ancient cultures. It has tremendous cosmetic value and is used in body and hair care as a moisturizer and skin conditioner. Moringa oil has been used in skin preparations and ointments since Egyptian times. This is very long lasting oil with a shelf life of up to 5 years. Moringa is a fast growing, perennial tree which can reach a maximum height of 7-12 m and a diameter of 20-40 cm at chest height. The Moringa tree is referred to as the “miracle tree” because of its wide array of uses. All parts of the tree are used for their pharmacological and nutritional properties. The use of moringa for medicinal purposes may seem to have its roots in folklore and myth, but indigenous people have found much success in using various parts of the tree to cure many physical ailments. Moringa Oil is highly valued in the cosmetic industry for its unique property. Moringa oil is light and spreads easily on the skin. It is best for massage and aromatherapy applications. Moringa oil is used in the following range of products. at the ratio of 3-100%. It also has nourishing and emollient properties giving it benefits for use in skin and hair care products. Moringa oil, as olive oil is useful in an efficient natural cleanser. By simply wetting the hair, massaging the oil into the scalp and rinsing can effectively clean and moisturize the scalp. It has nourishing and emollient properties, making it an excellent Massage Oil, which leaves the skin with a silky feeling. Rich in Palmitoleic, Oleic and Linoleic acids, Vitamins A and C and unsaturated fatty acid, Moringa oil has excellent moisturising and nourishing qualities. Moringa oil blends easily with essential oils and this combined with its non-drying quality and its ease of dispensability on the skin makes it as perfect massage oil. Perfume manufacturers esteem the oil for its great power of absorbing and retaining even the most fugitive odours. This Moringa Oil is in demand because it is so stable and resistant to rancidity and it has long been valued for its enfleurage property by the perfume industry. Useful in the manufacture of perfume and hairdressings. The oil is known for its capacity to absorb and retain volatile substances and is therefore valuable in the perfume industry for stabilising scents. This oil is known as the most stable natural oil, which is a good source of behenic acid and is used as a preservative in food industries. It is an excellent salad oil. The Moringa oil has Odorless to mild nutty flavour. It is also used as vegetable cooking oil. Due to its high quantities of Oleic Acids (Mono-Unsaturated Fatty Acid) is good for sautéing and deep frying. The bright yellow oil with a pleasant taste has been compared in quality with olive oil. It can also be used in salad dressings.